[S3] Marlene A. Eilers, Queen Victoria's Descendants (Baltimore, Maryland: Genealogical Publishing Co., 1987), page 166. Hereinafter cited as Queen Victoria's Descendants. [S12] C. Arnold McNaughton, The Book of Kings: A Royal Genealogy, in 3 volumes (London, U.K.: Garnstone Press, 1973), volume 1, page 126. Hereinafter cited as The Book of Kings. 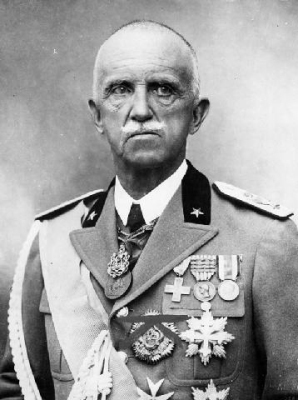 Vittorio Emanuele III di Savoia-Carignano, Re d'Italia was born on 11 November 1869 at Naples, ItalyG.3 He was the son of Umberto I di Savoia-Carignano, Re d'Italia and Margherita Maria di Savoia-Genova, Principessa de Savoia.4 He married Jelena Petrovic-Njegoš, Princess of Montenegro, daughter of Nikola I Petrovic-Njegoš, King of Montenegro and Milena Vukotic, on 24 October 1896 at Rome, ItalyG.3 He died on 28 December 1947 at age 78. [S12] C. Arnold McNaughton, The Book of Kings: A Royal Genealogy, in 3 volumes (London, U.K.: Garnstone Press, 1973), volume 1, page 283. Hereinafter cited as The Book of Kings. 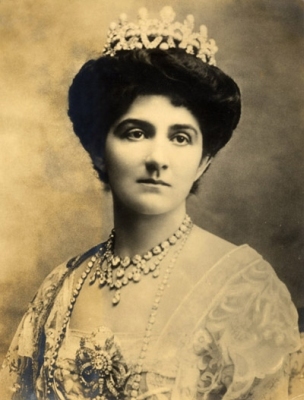 Jelena Petrovic-Njegoš, Princess of Montenegro was born on 8 January 1873 at Cetinje, MontenegroG. She was the daughter of Nikola I Petrovic-Njegoš, King of Montenegro and Milena Vukotic.3 She married Vittorio Emanuele III di Savoia-Carignano, Re d'Italia, son of Umberto I di Savoia-Carignano, Re d'Italia and Margherita Maria di Savoia-Genova, Principessa de Savoia, on 24 October 1896 at Rome, ItalyG.4 She died on 28 November 1952 at age 79. [S12] C. Arnold McNaughton, The Book of Kings: A Royal Genealogy, in 3 volumes (London, U.K.: Garnstone Press, 1973), volume 1, page 127. Hereinafter cited as The Book of Kings. [S16] Jirí Louda and Michael MacLagan, Lines of Succession: Heraldry of the Royal Families of Europe, 2nd edition (London, U.K.: Little, Brown and Company, 1999), table 145. Hereinafter cited as Lines of Succession. Tatiana Louise Ursula Therese Elsa Prinzessin zu Sayn-Wittgenstein-Berleburg was born on 31 July 1940 at Giessen, Hessen, GermanyG.1 She is the daughter of Gustav Albrecht Alfred Franz Friedrich Otto Emil Ernst Fürst zu Sayn-Wittgenstein-Berleburg and Margareta Fouché.1 She married Moritz Friedrich Karl Emanuel Humbert Landgraf von Hessen-Kassel, son of Philipp Landgraf von Hessen-Kassel and Mafalda Maria Elisabetta Anna Romana di Savoia-Carignano, Principessa di Savoia, on 1 June 1964 in a civil marriage.1 Tatiana Louise Ursula Therese Elsa and Moritz Friedrich Karl Emanuel Humbert were also married in a religious ceremony on 3 June 1964. She and Moritz Friedrich Karl Emanuel Humbert Landgraf von Hessen-Kassel were divorced on 16 October 1974 at Kiel, Schleswig-Holstein, GermanyG. Gustav Albrecht Alfred Franz Friedrich Otto Emil Ernst Fürst zu Sayn-Wittgenstein-Berleburg was born on 28 February 1907 at BerleburgG. He was the son of Richard Hermann Gustav Fürst zu Sayn-Wittgenstein-Berleburg and Madeleine Prinzessin zu Löwenstein-Wertheim-Freudenberg. He married Margareta Fouché, daughter of Charles Louis Fouché, Duc d'Otrante and Hedvig Ingeborg Madeleine Grevinne Douglas, on 26 January 1934 at Björnlunda, SwedenG. He died in 1944 at RussiaG, missing in action. [S3] Marlene A. Eilers, Queen Victoria's Descendants, page 170. Margareta Fouché was born on 28 March 1909 at Elghammar, SwedenG. She is the daughter of Charles Louis Fouché, Duc d'Otrante and Hedvig Ingeborg Madeleine Grevinne Douglas.2 She married Gustav Albrecht Alfred Franz Friedrich Otto Emil Ernst Fürst zu Sayn-Wittgenstein-Berleburg, son of Richard Hermann Gustav Fürst zu Sayn-Wittgenstein-Berleburg and Madeleine Prinzessin zu Löwenstein-Wertheim-Freudenberg, on 26 January 1934 at Björnlunda, SwedenG.